DriveABLE Technologies provide an objective research and evidence based medical fitness to drive assessment. DriveABLE Technology is provided by this Occupational Therapy Consultancy / Medical Driving Assessments NZ. The DCAT assessment provides essential PRE-DRIVE cognitive status information. The DRIVEABLE ON ROAD EVALUATION (DORE) assessment is the on road assessment. Individual Personalised driving lessons are provided where required e.g. teen keeps failing test, failed OT MDA. DCAT results assist in planning the individualised Driving Tuition course content. LEARNER DRIVERS: If a driver has any perceptual or cognitive challenges and wishes to learn to drive contact us on 021 138 0124 to discuss the options. 1.1.1 Have you, or someone you know, been advised to have an Occupational Therapist Medical Driving Assessment? which are approved by NZTA. NZ registered Occupational Therapist who is approved by NZTA. tend to make. The DORE may be recorded for quality assurance and training purposes. as an instructor.The occupational therapist also accompanies and assesses the client during the drive. checking and indication / awareness of other road users / parking/ remembering instructions. e.g. going shopping etc. including all the above skill sets. The results of the assessment are sent to the referring specialist and NZTA. being able to learn new information, retain the information and be able to demonstrate newly acquired safe driving skills. 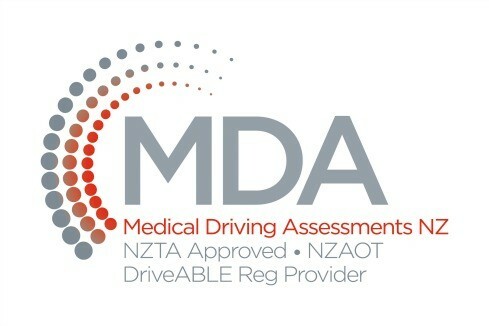 Fitness to Drive Assessment ( OT MDA) (OT MDA) required by NZTA. NZTA requires the OT medical fitness to drive assessment to be completed and passed as per your medical referral. process. (No change of outcome is implied.) The on road performance during the re-sit defines the outcome. A re-sit of the DriveABLE On Road Evaluation (DORE) must then be successfully passed. Occupational Therapist and– both are registered NZTA Providers. The ‘Certification of Course Completion’ is acknowledged by NZ Ministry of Justice, NZ Police and NZTA. GP alert – NZTA DL9 form – The ‘Road Safety Test’ (given by a non medical Tester) is on the form as an option, but has no medical components or standardisation. This is not an option where there is a medical history indicating potential cognitive impairment i.e. any oxygen compromise at cellular level. E.G. A person who had recently passed this test was unable to interpret and proceed through a controlled intersection (LIGHTS) without assistance, during the OT medical fitness to drive assessment (DriveABLE). 90% of patients with mild cognitive impairment are not identified in the primary care setting. SIMARD MD – Screening for the Identification of the Cognitively Impaired Medically At-Risk Driver assessment tool which was introduced by Dobbs,B.M. & Schoflocher,D (2010) Contact us for more information. SIMARD MD – This is a screening test NOT a pass / fail test – any score under 120/130 where there are chronic medical conditions would indicate an assessment is the most prudent course of action. Missing traffic signs Problems with other day to day activities. Expert Driver Training and Driver re-training provided to all age groups in any type of vehicle. is your Teen ready to drive? Does your teen keep failing the NZTA on road test ? This will improve your standing with ACC and Insurance providers. Are your drivers Medically Fit to Drive? Are the drivers safe competent drivers? Which Industry are you in – Corporate, Private, Heavy Transport, Education, Teen Drivers, Public and Private Health, Mental Health, Sports, Elderly Residential Villages, NGO services, Volunteers providing transport, Hospitals, Driver training, Rail and Bus Transport. Have you been advised to have a medical driving assessment? Have you had a stroke, a head injury, sleep apnoea, or are you experiencing the effects of chronic medical conditions? Has your memory become less reliable? Do you suffer driving fatigue on a long journey, earlier than you used to? Does your teen keep failing the on road driving test? Do you want to know why? Transport industry employers – Are you sure all your heavy vehicle drivers are medically fit to drive? Do they need upskilling? Driving is a very complicated process and requires full engagement of our cognition. Its not enough to be able to physically drive the car – we must also be able to react quickly, safely and effectively to situations occuring on the road. We also need to be sure we are not causing accidents by our mistakes and slower reactions. An OT medical driving assessment will ascertain whether your driving skills have changed and whether you are still a safe driver. Legally – If your GP, Geriatrician, Psychiatrist,and Occupational Therapist have concerns that your ability to drive safely may have changed, due to medical conditions, he/she will have to request you to undergo a medical fitness to drive assessment by an Occupational Therapist. GP alert – NZTA DL9 form – The ‘Road Safety Test’ (given by a non medical Tester) is on the form as an option, but has no medical components or standardisation. E.G. A person who had recently passed this test was unable to interpret and proceed through a controlled intersection (LIGHTS) without assistance, during the OT medical fitness to drive assessment (DriveAble NZ). Do your drivers require expert driver training or re-training in any type of vehicle? An Occupational Therapist Medical Driving assessment maybe required, by NZTA, for a driver, following injury or illness. Advanced Driving skills for Experienced Drivers and NZ Road Code Course provided – Driver cognition and driving performance, plus NZ road code competence are assessed. NZTA approved Occupational Therapist and Instructor provide the courses. Are you prepared to employ a driver who has medical conditions and who has not been assessed as medically fit to drive? These drivers are responsible for expensive rigs and equipment, often carrying expensive and often hazardous loads. Heavy Industries Transport Driver Training available for all classes of licences – truck and trailer units – all tonnage.etc. Endorsements and driver training – new drivers and experienced drivers. Drivers experiencing difficulty passing the tests? – is there a medical reason? Inadequate road code knowledge? Medical fitness to drive assessments where appropriate. Volunteer drivers need to be safe drivers, and medically fit to drive. Some may also benefit from a course of driving lessons to upskill. Volunteers and teachers may be transporting our children. Presentations on ‘Cognitive Impairment and Driving’ provided by the Occupational Therapist. What pressures are put onto your teeager to obtain a driver licennce before they are cognitively competent to pass? …. Is your teen ready to drive yet? Teen struggling with school work? Cognitive impairment involved? Had a concussion or head injury? Peer pressure – have you considered the pressure your teen may be under by peers, if she or he has a car and driver licence? Would you like to engage a highly trained and experienced driving instructor to teach your teen to drive safely with healthy attitudes to road safety? Are all your drivers safe drivers? Take the DCAT test – DriveABLE Cognitive Assessment Tool identifies cognitive impairment, provides post concussion/ TBI information and is 95% accurate in predicting on road performance. Many sports people now have to consider the effects of concussion on driving – test for cognitive impairment if you are concerned. The on road (DriveABLE On Road Evaluation – DORE) assessment is undertaken by the occupational therapist and experienced instructor – both NZTA approved. Has your GP asked you to have an Occupational Therapist Medical Driving Assessment in order to have your licence renewed etc? Driving lessons for experienced drivers – a different skill set is required to teach experienced drivers new techniques to ensure safe driving habits. Drivers residing in and those providng transport for Residential Care and Villages – are they all medically fit to drive? Licence renewal – OT Medical Driving Assessment required? Family Concerned? Driving skills of a relative may have changed recently – what shall we do about it? You, or someone you know, may need an OT medical driving assessment to ascertain whether your driving skills have changed and whether you are still a safe driver, or whether you are now ‘ready to drive’. Its not sufficient to be able to physically drive the car – we must also be able to react quickly, safely and effectively to situations occuring on the road. 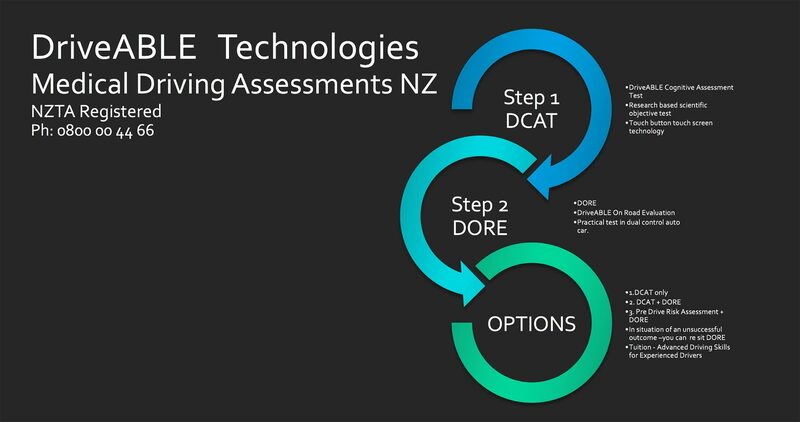 The assessment process provided by DriveABLE NZ involves Internationally Approved Methodology – your licence is important to you, and the assessment process reflects this. Just call Anne, and she will explain what is involved. NZTA require all drivers to be medically fit to drive, to ensure all drivers, and others on the roads, are as safe as possible. This includes heavy vehicle drivers, taxi drivers, bus drivers, train drivers, and ofcourse all car drivers – teens to seniors. This is not the same as a ‘road safety test’. The standard ‘on road safety test’ is not an accepted assessment of medical fitness to drive. If you refuse the OT medical driving assessmentt, then the medical professional is required to inform NZTA of their concern. NZTA will most likely revoke your licence until you have demonstrated that you are able to pass an OT Medical Fitness to Drive assessment. Your GP is required to inform NZTA if he/she feels you may have become medically unsafe to drive, and you will then need to sit a medical driving assessment to keep your licence – Driving is a privilege not a right. Have you, or someone you know, been advised to have a medical driving assessment? Call Anne on 021 1380124 to answer your questions for you. Impaired decision making for entering intersections or making right turns is a safety problem in both familiar and unfamiliar locations. If you answer ‘yes’ to any of these you may need to provide a medical or eyesight certificate. SAFE driving is paramount – No one wants to injure another person, because they are a medically / cognitively unsafe driver. We all have to take responsibility to ensure we are medically safe to drive. You may need a medical driving assessment to find out. Although many people have an excellent driving record, when we develop medical conditions things can sometimes change. It is much better to know whether or not we are still a medically safe driver, rather than to wait for an accident or tragedy occur, to find out. 1. Have you noticed any change in your driving skills or behaviour, eg. road rage? 2. Do others toot at you or show signs of irritation? 3. Have you lost any confidence in your overall driving ability, leading you to drive less often? 4. Have you ever become lost while driving? 5. Have you ever forgotten where you were going? 6. Do you think that at present you are unsafe to drive? 7. Have you had any car accidents in the last year? 8. Any near misses or crashes with other cars in car parks? 9. Have you received any traffic tickets for speeding, going too slow, improper turns, failure to stop, etc.? 10. Have others criticised your driving or refused to drive with you? 1. Do you feel uncomfortable in any way driving with the person? 2. Have you noted any abnormal or unsafe driving behaviour? 3. Has the person had any recent crashes? 4. Has the person had near-misses? 5. Has the person received any tickets or traffic violations? 6. Are other drivers forced to drive defensively to accommodate the person”s errors in judgement? 7. Does the person need a co-pilot to alert them to potentially hazardous events or conditions? 8. Have others commented to you on the person”s unsafe driving? Referral to an OccupationalTherapist for an OT Medical Driving Assessments is a kindness, especially when it can prevent tragedies…..
Below – referral for an Occupational Therapist Medical Driving Assessment, as required by NZTA, may have prevented the following motor vehicle accidents….. If this driver had been assessed for medical fitness to drive…..
Police believe medical conditions may have affected the judgment of an 86-year-old man who caused a series of crashes as he drove the wrong way down Auckland’s Northwestern Motorway.